If your B2B tech company is on social media, you probably have realized one thing: getting started is easy — growing your presence is hard. You have a lot of competition out there — and no, not just from your competition. You are rivals of the fleeting attention spans of your target audiences as they scroll through content from friends, family, and brands. Let’s say, for instance, one of your target personas is Oliver the Chief Operations Officer. You have him dubbed as a male in his late thirties or early forties. While Oliver might “like” your page on Facebook, he also “likes” pages about golf, travel, and parenting. And of course, he’s naturally engaging with content from friends and family. And then of course, the vicious cycle begins. Oliver doesn’t see your content, so Oliver doesn’t click like, comment on, or share your content. When Oliver doesn’t interact with your content, he’s less likely to see it again in the future. So how DO you grow your following? We’d like to say the answer is simple, but it’s not. (Well, nothing in marketing is really all that simple.) Growing your social media following takes dedication, a tactful implementation of some standard social media best practices, and some additional time, effort, budget, and strategy. If you’re looking to grow your following, you’ll want to add these tactics to your current social media strategy. Hashtags make it possible for you to reach new people completely free by sharing content in streams that already interest them. #growyourfollowers Hashtags began on Twitter but have found their way in different applications on Instagram, LinkedIn, and many other platforms. Facebook is the only major tool that doesn’t play nice with hashtags. While Twitter and LinkedIn still dominate the B2B tech world, Instagram is coming on strong. Why? It offers a robust hashtag capability. You can use up to 30 hashtags per post. That provides you with 30 opportunities to get your content seen by new individuals. The biggest advantage that Instagram has over other social networks is that it tells you how many posts already exist within that hashtag, which gives you an idea of how likely it is for your content to be seen. To find these statistics, click on the magnifying glass, click inside the search window, click the tags tab, then type the term you’re interested in. On Instagram, the key to your success is relevancy and content quality, as top influencers will likely always steal the top spot. In any case, avoid using hashtags with hundreds of thousands of posts, as that will diminish the likelihood that your post is seen. Want to learn more about Instagram hashtags? This blog post details a rather simple Instagram hashtag strategy. But, you can also use the Tailwind App to do the research for you! Since LinkedIn implemented the use of hashtags, it has taken off rather quickly — which is hugely beneficial to B2B technology companies. Unlike Instagram which allows for up to 30 hashtags, you’ll want to keep your hashtag use to about five per post. While LinkedIn doesn’t appear to have a limit, #hashtags #can #just #be #really #annoying. Because users can follow a particular hashtag on LinkedIn, you have the ability — for free — to appear in prospects’ regular newsfeed even if they don’t like your page. This can help your grow your following if you post quality, relevant content. Another benefit of using LinkedIn is that you can also use hashtags in your LinkedIn articles, which can make your content marketing efforts on the platform all the more impactful. While Twitter was the birthplace of the Hashtag, it seems to have the least sophisticated system for engaging new followers. The recommended number of hashtags per post is also less — with a recommended number of 2-3 hashtags for maximum engagement. (And that’s a tip from Twitter itself!) This means it is important to choose your hashtags wisely! Unlike LinkedIn and Instagram, you can’t follow hashtags on Twitter — and posts will show up in a chronological order. This can make it difficult to sift through posts. And because hashtags can’t be followed, engagement doesn’t come as naturally as it does on Instagram and LinkedIn. We recommend spending time to develop a hashtag strategy. Do research on what hashtags your competitors are using, and what terms are used industry-wide. You may also want to make a list of event hashtags for the conferences you plan on attending throughout the year. Create a spreadsheet of all your hashtags so it is easy to pull from for all social media networks. You can’t get more followers without paying attention to the followers you already have. Engaging with your followers is not only good for your brand reputation, but it can also help to grow your following — especially on Facebook. 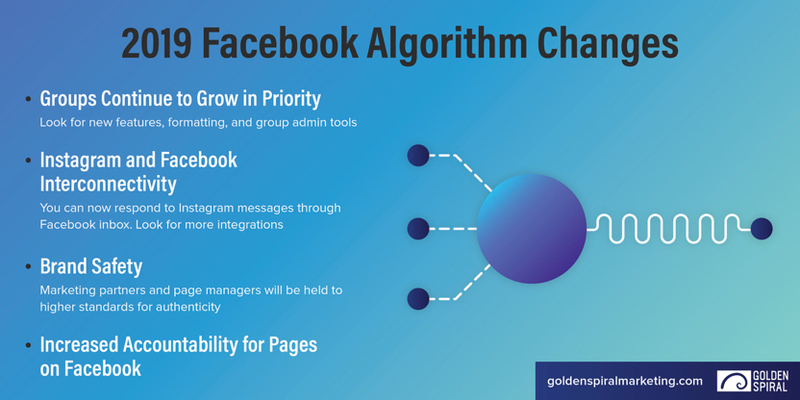 Facebook’s newest major algorithm update took place in 2018. The update made many brands wary of their organic reach, as the algorithm would favor posts with “meaningful interactions” over posts intended for consumption. In short, people matter more than brands — and if brands want to get noticed, they need to engage with their followers. That means replying to comments and starting conversations! Let’s say you post a really awesome video, and Stan Smith comments. Maybe, historically, because you were too busy you wouldn’t reply to Stan. But, if you want your post to maybe be seen by Stan’s other Facebook friends to grow your following, you should. Plus, responding is the socially polite thing to do. If you are struggling to engage your audience, consider asking questions or creating a poll. Creating engagement is akin to priming a pump. Before municipal water was installed to most every address, many homes had wells with hand spigots on the surface. Sometimes, owners would have to pour water over the pump in order to get the pump to draw water up from the well. Plus, it's just a good life lesson. You can’t buy friends… but you can buy brand awareness. Social media ads allow you to get in front of new audiences without the run around of hashtags and algorithms. However, many brand make the same mistakes with social media ads that they do on PPC ads — including a lack of relevancy, poor landing page development, and sending prospects directly to sales. It is important to remember that social media is a recreational and social experience. People are on Facebook while watching their favorite show on Netflix, laying in bed, and, um, using the bathroom. In none of those scenarios is someone in the state of mind to make a massive investment in technology for their team or company. Investing in ads means playing the long game — sharing helpful content and ideas with new audiences who fit your demographic in a hope to gain followers, which could turn into customers. Fortunately, all social media platforms force you to define a goal for your ads. For example, Facebook provides six options — one of which is “promote your page,” which inherently means to grow your following. In all cases, to build your social media following, you need to focus on earning followers with your ads. That mans building trust by providing great content and resources, and speaking directly to the pain points, obstacles, and goals of your target personas. It’s been proven time and time again that people like connecting with people more than they like connecting with brands. And as a B2B tech company, you don’t just have amazing technology, but also, amazing people. Leverage the individuals at your company, including your C-Suite and upper-level management, who have strong social media followings. Ask them to re-post content from your social media accounts, and share content directly from your website. These brand ambassadors can drive traffic back to your brand social media accounts in an organic and authentic fashion. You can also depend on these individuals to join Facebook and LinkedIn groups and other forums to respond to industry questions, and propose your product as a solution by simply tagging you in a post. If you want to grow your social media following, devote time and research to hashtag research, ads, and building authenticity through your people and engagement. Remember that at the end of the day, your social media presence is only as good as the content you share and the stories you tell. You can’t grow your following without having a strong foundation, first.